Welcome to Milton West Elementary School's website pages on our District website. Milton West is the proud home of more than 300 outstanding PreK-3rd grade students, and we enjoy providing for some exceptional learning experiences and opportunities that are complimented by our character building efforts and living "The West Way". At Milton West we enjoy working in partnership with our students, parents and families so that learning potential is maximized, and the educational experience is a memorable one. If after you review these pages on our website you still have questions or concerns, please contact us at the information listed above. All Milton West students can learn. Staff will establish high standards of learning and achievement for each student. Milton West staff will teach all students to persevere (productively struggle) and experience on-going success. You can access Milton West Elementary's schools supplies list, and all of our schools supplies list by clicking on the link to our schools page below. 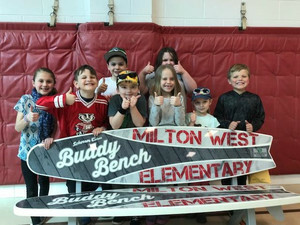 Milton West Elementary School students and staff are excited to share the many AWESOME things that happen in our school with our families and the world using social media. We have two (2) social media accounts, which include a Facebook page and a Twitter account. You can access links to each one below. Please join us in celebrating the success of our amazing students and staff at Milton West and "Like" us on Facebook, or "Follow Us" on Twitter.